Perfectly preserved. This Mother slowly rocks back and forth as she contemplates your fate. Foam-filled body with metal armature. Soundtrack CD is included. You provide the rocker and CD player. Costuming may vary. All electric heavy duty motor and uses regular household current. She runs continuously - not motion or sound activated. Her mechanics are solid steel - nothing plastic. A very high quality Halloween prop. 110-240 V. Part of the Frightronics line of animated props by Distortions. She is as described, solid steel and high quality. will scare the crap out of the kids. I have the lullaby prop as well and their both excellent props. Every year I have "Seriously" Thousands of People visit my Home Hauntin Long Island, N.Y. called, Joe Allocco's The Franklin Square Horror. But every year those visitors expect something new, something different. The Mother animated prop is exactly that. 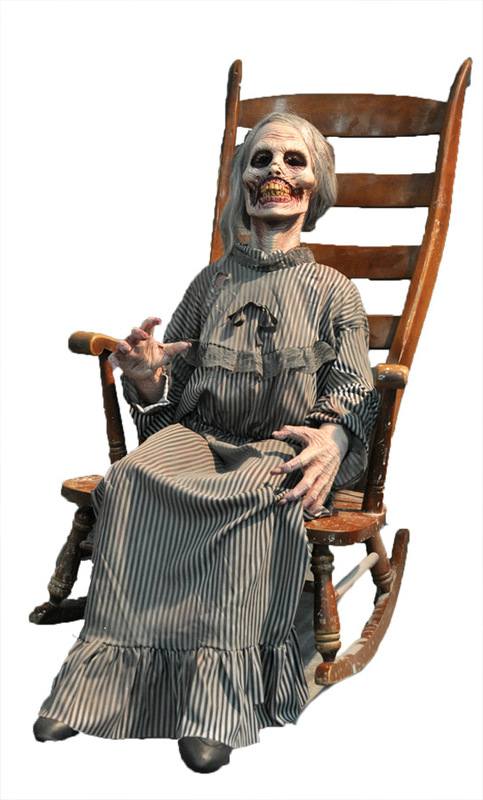 You supply the rocking chair and this prop supplies the Haunted Atmosphere. It's Incredible and worth every cent! It's going to blow everyone away this year at my Halloween Extravaganza!